Verizon Data » Brewology - PS3 PSP WII XBOX - Homebrew News, Saved Games, Downloads, and More! Returning this Friday, Verizon will again begin to double their data packages (all for the original price). 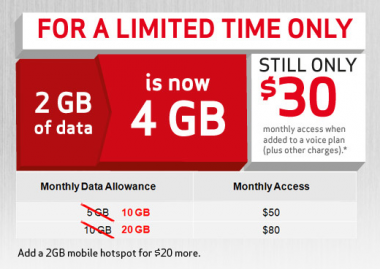 This means the 2GB limit will be pushed back to 4GB, a great deal for those not grandfathered into a now unavailable Unlimited data package. The only stipulation? You must be a customer newly signing up under a 4G plan for a smartphone. This includes new customers as well as customers willing to extend their 2 Year prison sentence.